Located in the center of campus, north of Cooper Dining Hall, the building includes a convocation/ice arena, as well as educational rooms and student organizations. Among the departments housed in the campus center are Psychology, Experiential Learning, a career asset geared toward preparing students for the professional world, and Accessibility Resource Services. 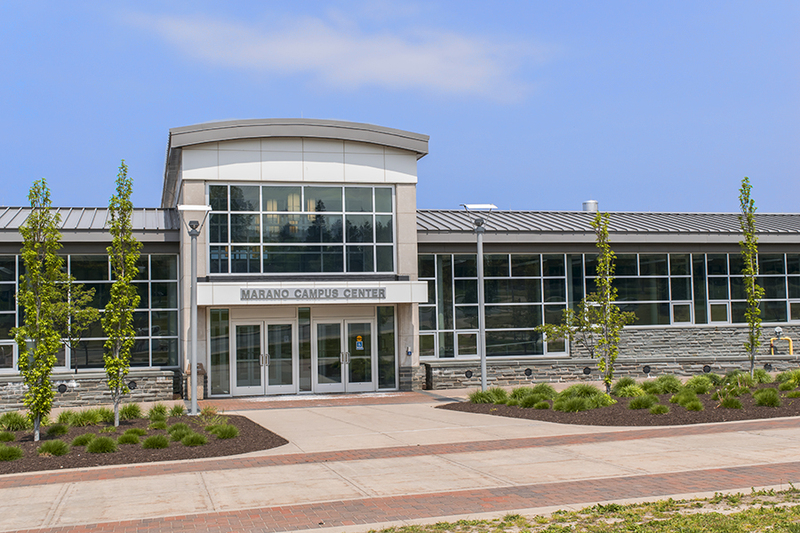 Originally named the Campus Center when it officially opened in 2006, “Marano” was added to the beginning of the name in 2014. This was done in honor of Lorraine and Nick Marano, after Lorraine Marano donated $7.5 million to establish the Nunzio “Nick” C. and Lorraine E. Marano Endowment. Lorraine Marano achieved degrees from from Glassboro State College in New Jersey, now Rowan University, and Drexel University in Philadelphia, before becoming a high school librarian Cherry Hill Public High School East, New Jersey. Lorraine and Nick Marano would eventually make their way to Central New York, where Lorraine Marano earned a degree from Syracuse University in 1990. Nick Marano held noteworthy achievements of his own, crafting a career in banking and holding a seat on the New York Mercantile Exchange.